Making my home a haven of quiet and peace - rest and protection from the world outside our door - that is my dream. To that end, I've joined in with Crystal and will try to keep track of how things are slowly and hopefully steadily changing around our home to make it a haven for us. One thing I've done that has made my life less stressful (and Husband, too) is to organize our bathroom cupboard. It is large and deep and things really tended to get lost under the pile that was simply shoved in with very little rhyme or reason, in turn making it a near nightmare when an item needed to be found. So, I went to the store and got these great bins and then spent the better part of the day in the bathroom -- cleaning out all of the clutter, and what an amazing lot of it there was! -- until it was all organized; a place for everything, that is within easy reach, and everything in its place! 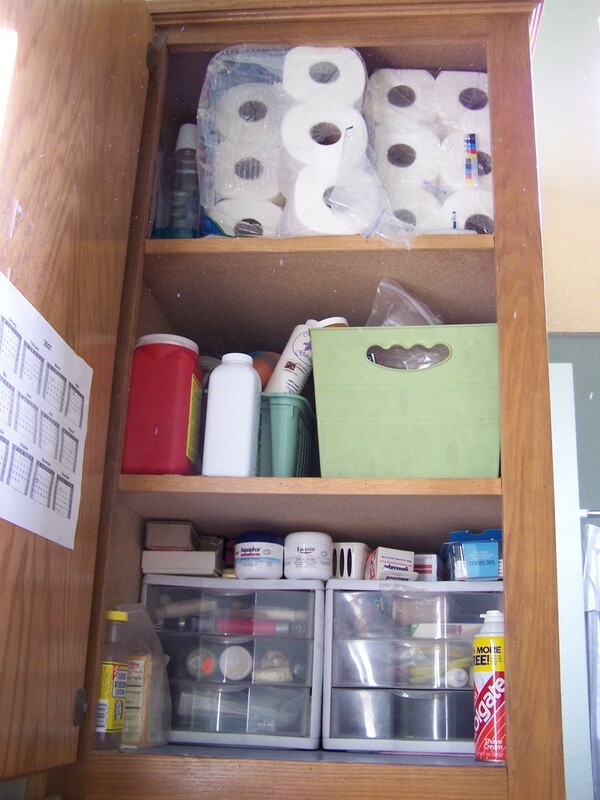 The top shelf, of course, holds the bulky toilet paper, the middle shelf has a bin for all of my husbands' candle-making supplies, and a large bin for all the miscellaneous stuff that didn't quite fit anywhere else. On the bottom shelf I added two of the drawered cabinets to hold all the little things - extra toothbrushes, toothpaste, band-aids, hair clippers, my seldom used make-up and nail polish, first aid supplies, and more. 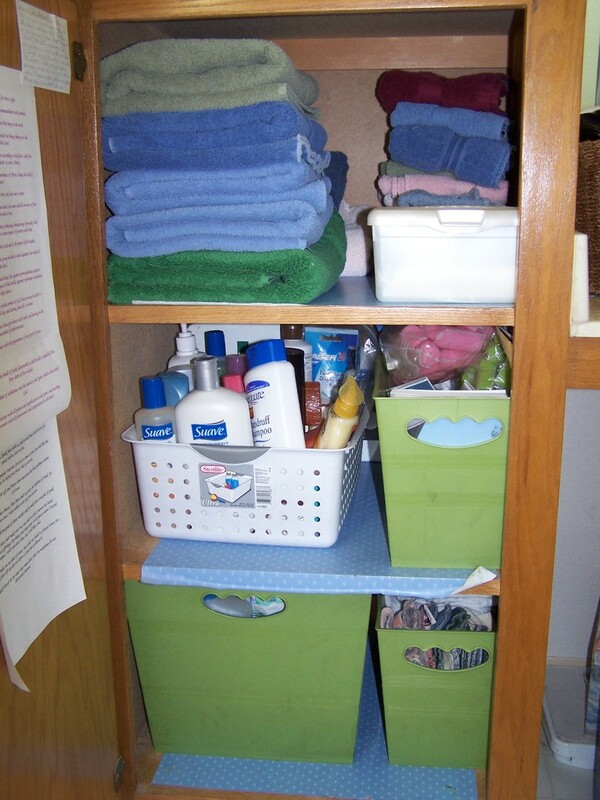 In the lower cupboard, there are neatly stacked towels - bath towels, hand towels, washcloths, and wipes all have their own space (Yeah!!). The second shelf has the white bin full of personal toiletries -- extra shampoos, conditioners, lotions, bar soap, soft soap, styling products, hairspray, etc. The bin next to it holds all of our curlers (three different sizes), along with a large tub of styling gel. In the front of this bin is also where I keep my reading material - books or magazines - that I can quietly enjoy when I need to. On the bottom shelf in the BIG bin is all of our cleaning supplies, and the smaller bin holds my cloth menstrual pads within easy reach when I need them. Taped inside the door of this cupboard are some of our memory chapters - another reminder to think on whatever things are true. 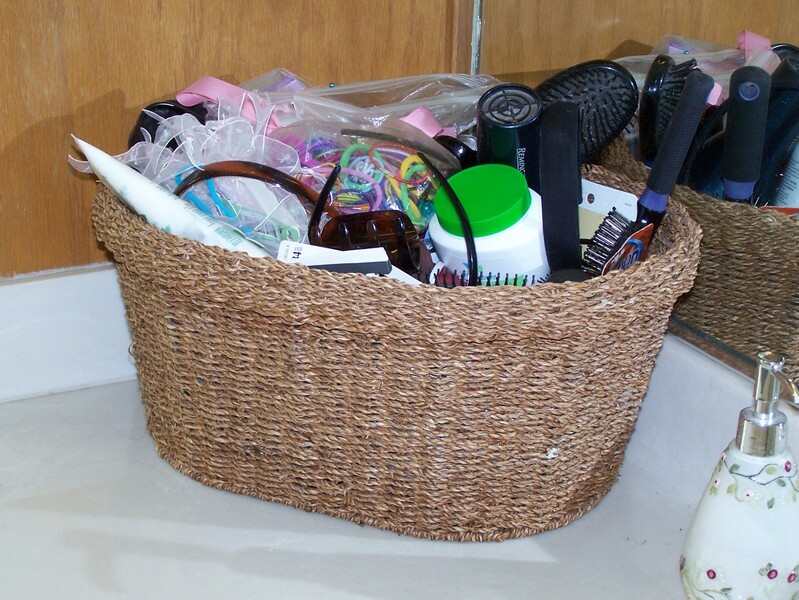 One more bathroom item-- this great basket which sits on our long bathroom counter and holds all of the "stuff" that daughter and I use: hairdryer, curling irons, brushes, headbands and hairbands, clips and bobby pins, ribbons, lotions and more. Another thing which makes life so much more peaceful is meal planning. Usually when I had planned meals before, it was just dinner. What a difference it makes when you plan breakfast and lunch, too! I would not have imagined how much nicer it would be. Breakfast: Amish Baked Oatmeal, fresh bread (from the bread machine set the night before) with yogurt and fresh or dried fruit (2 days), toast with scrambled eggs and fresh fruit, Freezer French Toast, Millet or Blueberry Muffins, Blender Pancakes. Lunch: Tuna & crackers (with salad and sprouts), sandwiches with chips and fresh fruit (2 days), Mexican Pizzas, Refried Bean (homemeade!) burritos, leftovers, fresh bread (bread machine) with tuna or a fondue. Dinner: Spaghetti with fresh bread (bread machine), couscous/millet burritos (with leftover Refried Beans), Garlic Breaded Chicken Breasts with Foccacia Bread and salad, tacos with all the fresh fixings, Beerocks, roast with onions/carrots/celery/potatoes and fresh bread (bread machine), leftovers. Snacks: available any time - fruit, Chex Mix, crackers w/cheese, apples or celery w/peanut butter. Having everything planned has been a BIG help in the level of peace and contentment in our house. I'm looking forward to learning more and more!